A delicate interplay between tranquillity and adventure, where the spirit of early explorers comes together with the flair of architect Bill Bensley, Capella Ubud pays tribute to an unwavering thirst for discovery. Fuelled by this thirst, each of the 23 luxury tents takes their name from the vocations of early explorers, whilst elsewhere around the camp, you’ll find The Officers Tent lounge, The Armoury gym and The Cistern swimming pool. Whilst Auriga spa tempts you with treatments inspired by the lunar cycle, at Capella Ubud you’re really here to take up the invitation to explore. 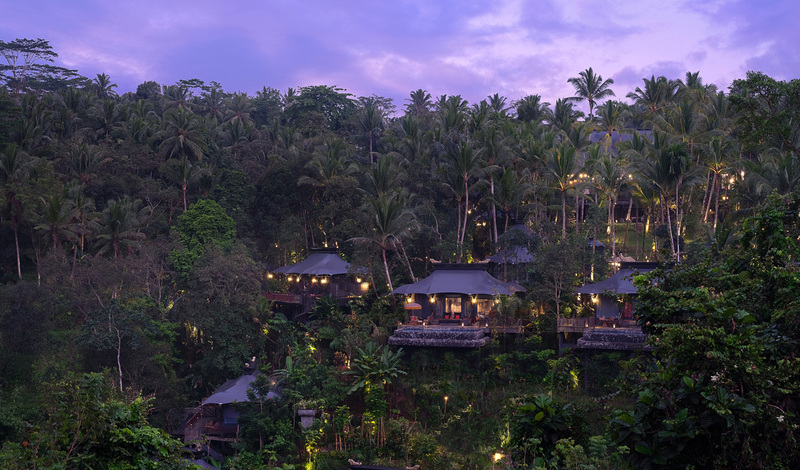 Hidden amongst the trees and unseen from afar, Capella Ubud looks to connect you with Bali’s untouched jungle landscapes. Just a 20-minute drive from the culture of Ubud and an hour from the island’s international airport, Capella Ubud proves that you don’t always have to go too far to escape the everyday. Tying together a timeless love of discovery with a modern-day appreciation for comfort, each of the 23 tents at Capella Ubud brings a unique personality. Outside, you’ll find a private saltwater pool extending out into the jungle or over sacred rivers, whilst inside, a freestanding hammered copper bathtub and king size canopy bed beckon at the end of each day. There’s also a duffel bag filled with camp essentials such as suncream and insect repellant on arrival, as well as a complimentary refreshments trunk to keep you fed and watered at all hours of the day. Much like the rest of Capella Ubud, the restaurants here have perfected the art on putting an unexpected twist on a traditional concept. Taking local flavours and injecting them with creative flair, the dishes here are designed to tell a story. Whether that’s one that leads you along the Spice Trail at Mads Lange or takes you into the tradition of Asian barbeque at Api Jiwa, dining here is a discovery in itself. End the day with popcorn by the Camp Fire cinema or sipping on a handcrafted cocktail at The Mortar & Pestle and this is a discovery you’ll want to make again and again.